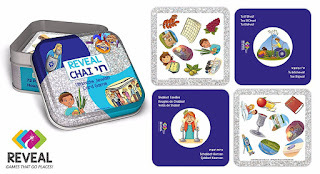 Kosherfrugal.com - Frugal Living in Israel: SALE - Reveal Israel and Reveal Chai Games! Have you heard about these great new games? They will make a great Shavuot gifts or summer birthday gifts for your family or friends! Right now, when you buy these games on Amazon (this seller only), you can take advantage of these special offers: Buy 1 get 10% off, Buy 2 get 15% off, Buy 3 get 20% off, Buy 4 get 25% off! Just put the games in your cart and the discount will show up at checkout! Discount will expire at the end of May!